GD-what? 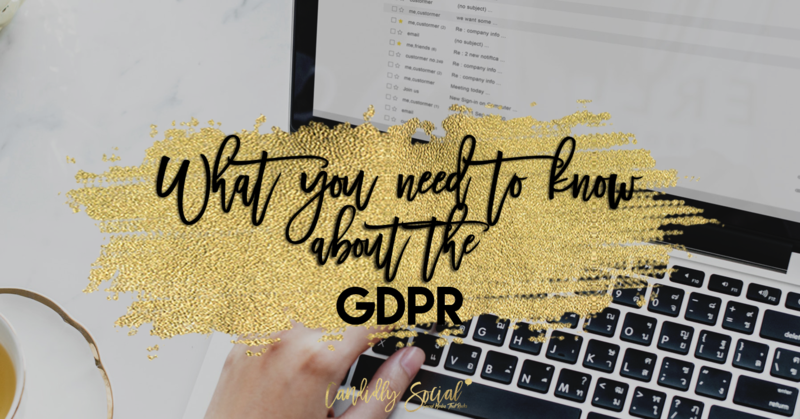 I’m sure you’ve heard a ton of chatter about the GDPR and your inbox has been filled with a million emails about it. But what is it and how does it affect you? Have no fear, we’ve got you covered! As of May 25th 2018 the GDPR has taken effect and not only does it affect companies in the EU (European Union), but it effects anyone that has clients in the EU. So in 99% of the cases, this affects you. Here’s what you need to know. Just like relationships, you need to be clear on your intentions and what you are doing with the data your clients are giving you. It’s also important to make sure you don’t use it in anyway that you have not specified. This means that consent can no longer be given passively by way of silence, pre-ticked boxes, or opt-out. This means that you can’t add a person to your email list if they haven’t explicitly asked you to. We’ve all heard of email lists that you can buy, even though it has always been looked down on, but now it’s highly illegal. We all have been asked for our emails in exchange of some printable or checklist. Now, this is no longer allowed. This is because these opt ins can be delivered in other ways then just an email. If your opt-in is something that is going to be delivered over the course of a couple of days, like a challenge, then you it is a-ok to collect emails. But there’s a catch, you can only email the challenge and once it is done then you can no longer send emails to the subscriber. Unless of course they have asked you to send them your newsletter. Think of this one as ghosting, if a person wishes to stop getting info from you then you are required to delete all their data and no longer contact them. They must be allowed to do this at anytime. This means that you must have an unsubscribe link on every email that you send out. Failure to comply with any of the changes can result in some hefty fines of up to 20 million EUR or 4% of your annual turnover (whichever is higher). Let’s be honest, ain’t nobody got time for that! Now that you know the basics, you should know that we are certainly not lawyers and this is not to be used as legal advice. It may seem like a lot of work, but let’s be real we’d rather put in the work than be hit with that hefty fine!